Udoka Azubuike and the Jayhawks will face No. 5 Tennessee in the final on Friday night. NEW YORK — Top five teams Kansas and Tennessee were tested in the NIT Season Tip-Off semifinals. Both passed and will face off in the championship game Friday night. Dedric Lawson had a double-double with 26 points and 12 rebounds to lead No. 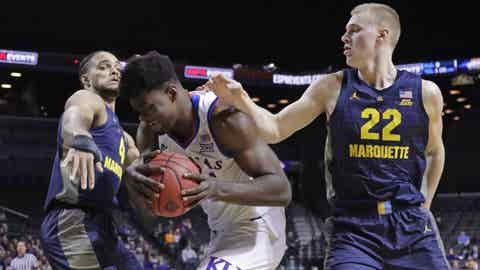 2 Kansas to a 77-68 win over Marquette in the second semifinal of the NIT Season Tip-Off on Wednesday night. Earlier in the evening, No. 5 Tennessee topped Louisville 92-81. Marquette (3-1) led by as many as 12 in the first half before taking a 47-38 lead into the break. Then came the Jayhawks run. The Jayhawks got 16 points from Lagerald Vick while Devon Dotson chipped in with 10 points, four assists and three steals.